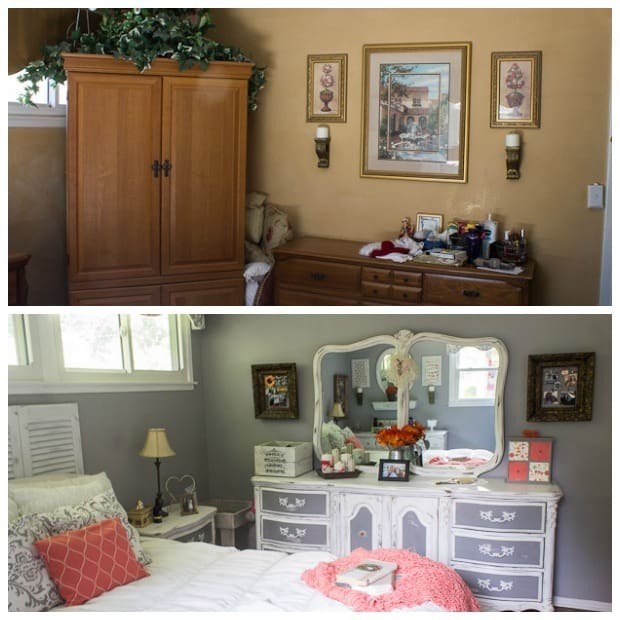 This room went from drab to fab with a gray and coral bedroom makeover! 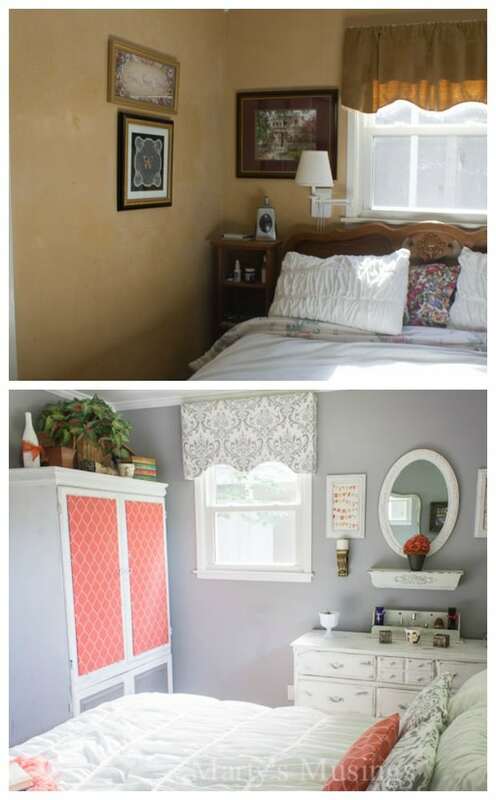 Complete with DIY projects and a tight budget this room has it all! The day is finally here! Begun back in February, I’m finally finished and able to show all the details of our gray and coral bedroom makeover! 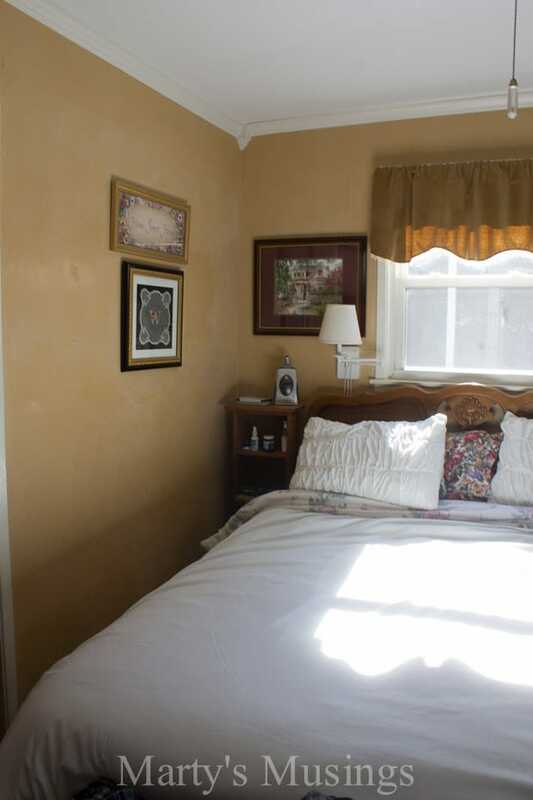 Desperately in need of reviving and updating, this room has my heart and soul poured into it. We had lived with the same furniture arrangement for 23 years. Yep, that’s right. 23 years. That’s a long time getting up on the same side of the bed, next to the man I love who helps me accomplish my dreams. 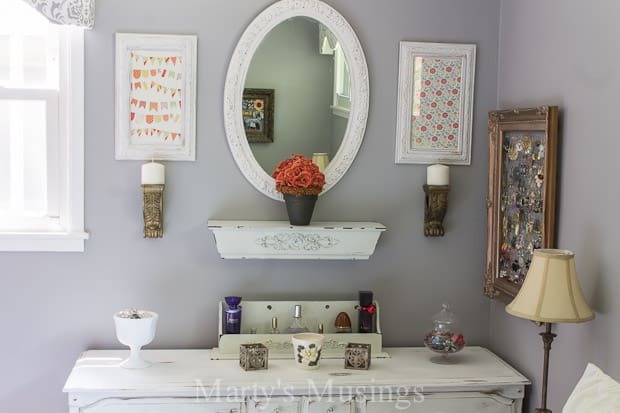 Every detail has been painstakingly reworked or repurposed with my own hands (or those of my DIY hubby). The ideas were mine. The color scheme was mine. The hard part of convincing my husband to let me paint the furniture was mine. Honestly, it was like giving birth! 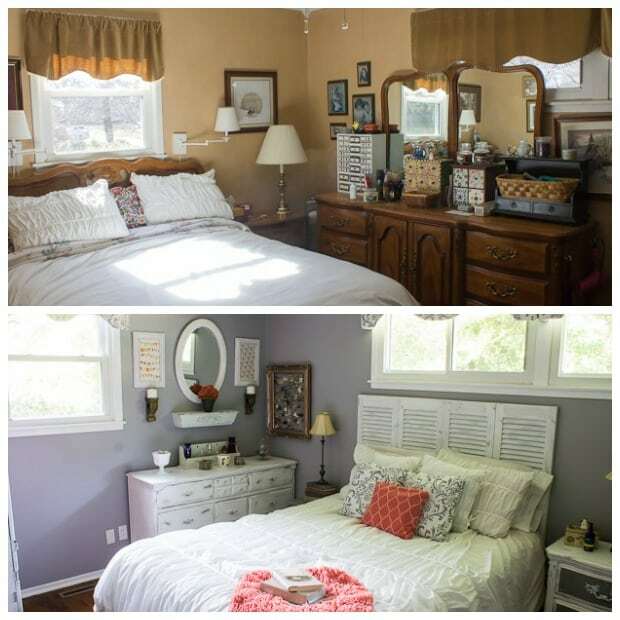 To those of you with larger bedrooms you may not know the huge obstacles you can face between practical and beautiful. I am so thrilled that this room now has both! 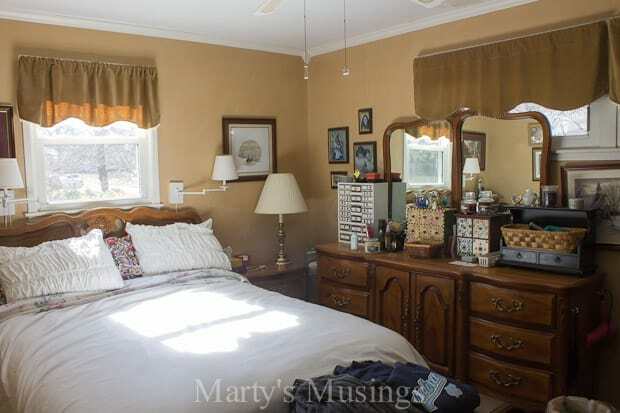 To fully appreciate this room I have to talk you through the before. The walls were done with venetian plaster, a decorative coating system that looks rough but was smooth to the touch. There was no cohesiveness, just a bunch of yard sale purchases and sentimental items I couldn’t part with it. 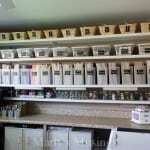 We began the makeover by painting the walls. You can read all the details in this post. 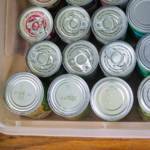 Most people find their fabric and then pick out a paint color. Not me! With a painting contractor husband, I just had to go against the norm and pick out the paint color first. 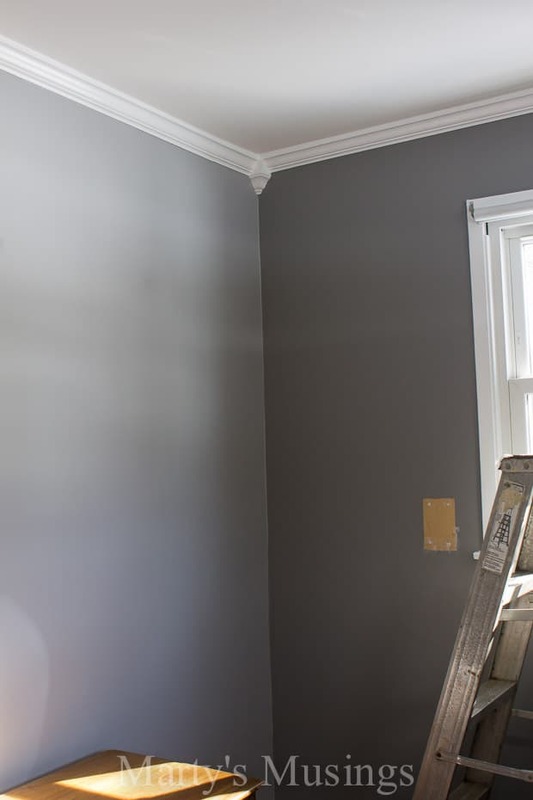 My initial idea was to use a darker shade of gray for an accent wall (similar to this one Tim did for our daughter Rachel and her husband), but I wasn’t happy with the combination of grays. So at 10 pm the night Tim painted we decided to try and rearrange the furniture and see if it was possible to make this small room seem bigger. Guess what? After 23 years with the furniture in the very.same.spot we discovered a better layout and the transformation was on! When we rearranged the furniture I was so afraid I would get up in the middle of the night and run into a wall! 23 years of the same ol’ same ol’ makes for some pretty engrained habits! From there we were off to the races, with a few distractions along the way. What do you think? Isn’t it amazing? Who knew this room could be so inviting and serene? 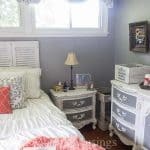 Here are more of the details on our gray and coral bedroom makeover: We moved the bed from under the long standard window to underneath the high wide windows. 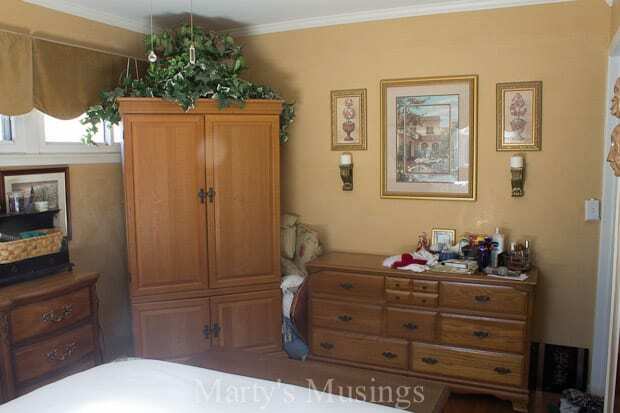 The only piece of furniture that we took out of the room was a hope chest that was at the end of the bed, and it freed up the space immediately. Tim built me the headboard out of louvered closet doors and I worked my magic with distressing. 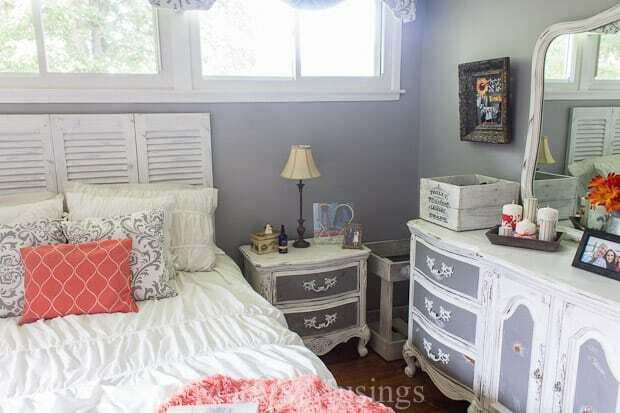 Our dark bedroom furniture was chalk painted and distressed. The difference is amazing! 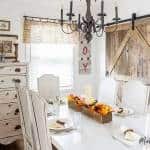 One of the most important elements of the room was the fabric. The comforter was passed down to me by my daughter because she knew exactly what I wanted. She also knew her mama wasn’t going to spend $400 or some such ridiculous amount on bed linens! 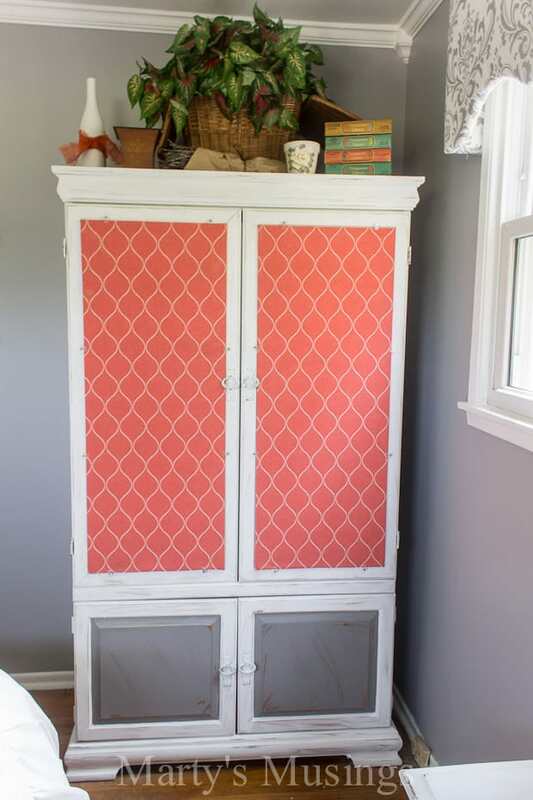 Looking back towards the larger window, I just love the pops of coral. 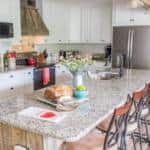 This room is lighter and brighter than any other in our home, but I still need some bold color mixed in. Tim and I went round and round about the wardrobe. We covered the inserts first with a fabric that just didn’t work and ended up choosing the fabric that was intended for cording around the window treatments. I’m totally thrilled with this gorgeous fabric. 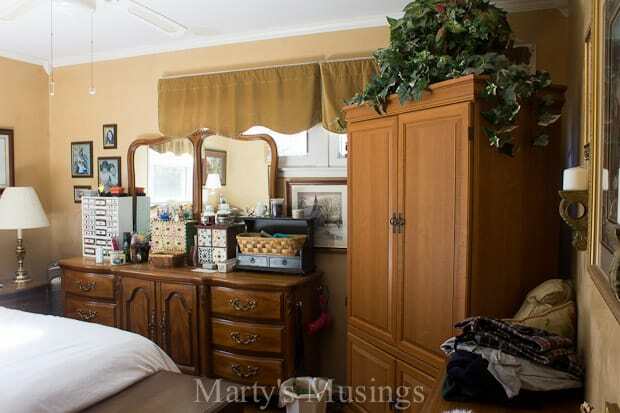 On the other side of the room you can see how amazing the dresser looks! This furniture was actually a hand me down from my brother many, many years ago. I had to talk Tim into painting it, and I think it adds just the right touch of shabby chic elegance. If you look closely into this corner you can see the fence board box Tim built me to store all those pillows from the bed. Like most men, I imagine, he can’t stand that many pillows so he gave me a place to put them. Thoughtful man, isn’t he? One of my favorite changes probably won’t surprise you. 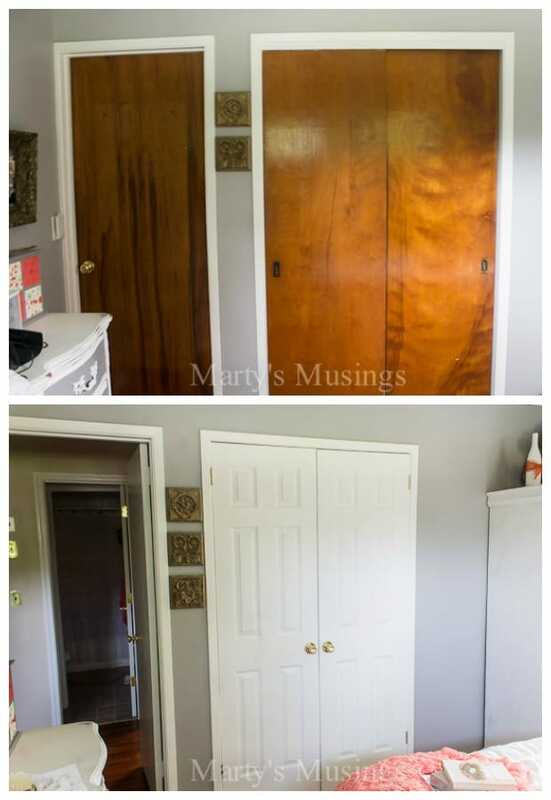 Since my love language is definitely DIY, my hubby nailed it with new closet doors. This may sound unfeminine, but give me doors that open instead of slide and I am in heaven! No flowers or candy for me! Guess whose idea it was? Yep. Mine. Love it. The end. Do you understand now why I’m so proud of this makeover? I learned how to chalk paint furniture with this room. I made a no sew bedskirt and pillows, and my husband and I tackled no sew cornices. The framed earring organizer was a DIY and I survived my first French graphic transfer project for a fence board repurposed box. I used scrapbook paper in several projects and mixed burnished gold accents with gray and white. I proved to myself that I could trust my own tastes and create a space that was both beautiful and functional. 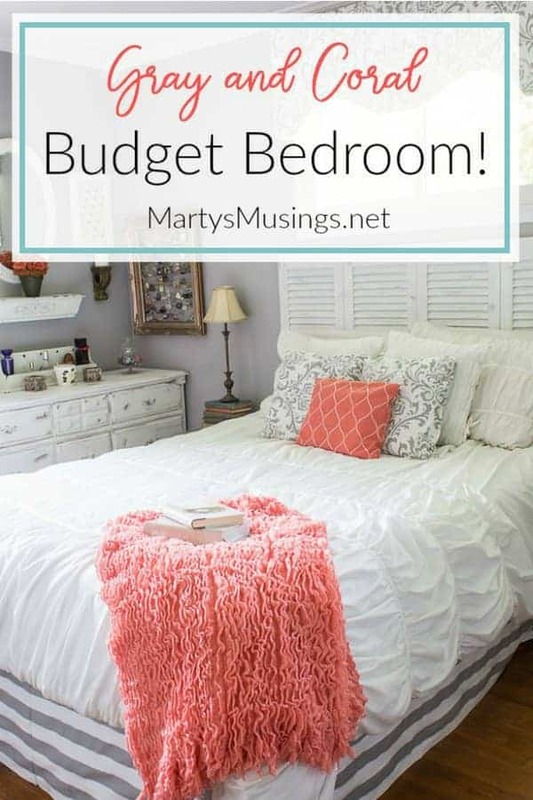 Click here for my best tips on how to decorate a bedroom for practically nothing! Where did you find the beautiful coral throw on the end of the bed? Hi, Cheri. The throw is from Home Goods. Thanks for the compliment! Have a wonderful day! Love your shutter headboard. Thank you for sharing. Need a headboard for my split king size bed. We were going to make small headboard, but love this idea. 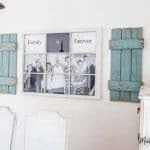 It is so disappointing that I got rid of some small shutters a few years ago. Guess I will have to look at yard sales or thrift stores. I just refinished and old old stain glass window with chalk paint. I love using chalk paint. I hung it on my wall over my bed. Now I am going to give your shutter headboard a try. My husband was going to fix a headboard with just lumber, now I have a better idea thanks to you. Hi, Brenda. 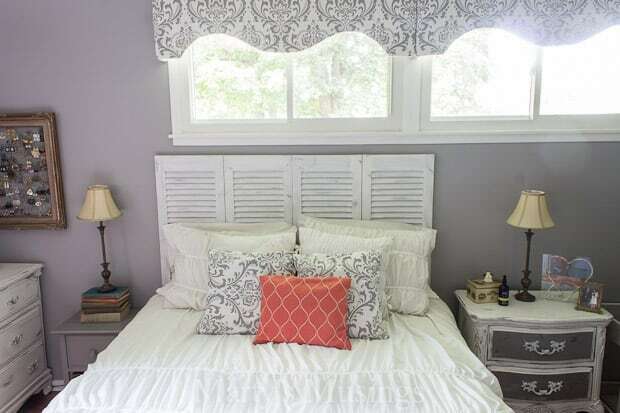 Shutters are usually fairly easy to find. You might also try construction sites or homes being remodeled but definitely yard sales and thrift stores. Good luck hunting!